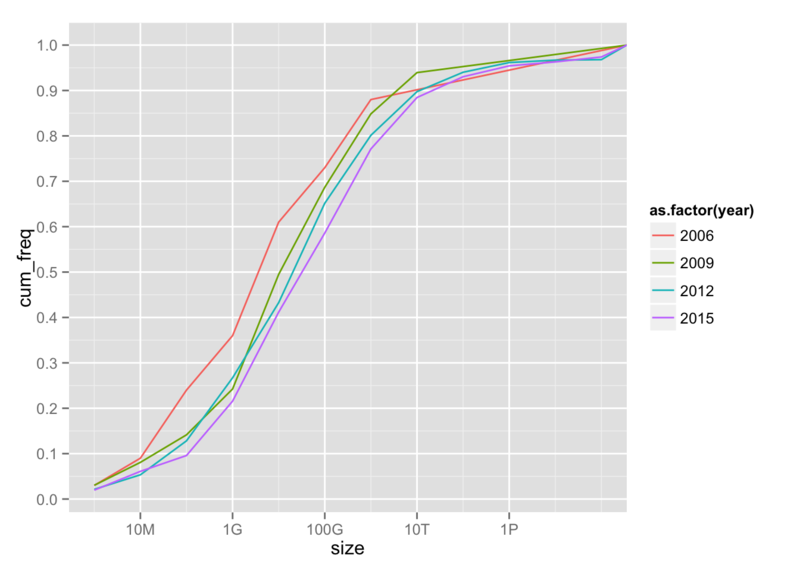 Here we analysed the KDnuggets surveys on the largest datasets used by practitioners to find out need for the Big Data tools over the Big RAM. By Szilard Pafka, DataScience LA. With so much hype about “big data” and the industry pushing for “big data” analytical tools for everyone, the question arises how many people have big data (for analytics) and how many of them really need these tools (which are more complex and often more immature compared to the traditional tools for analytics). During the process of data analysis we typically start with some larger “raw” datasets, we transform/clean/prepare them for modeling (typically with SQL-like transformations), and then we use these refined and usually smaller datasets for modeling/machine learning. In terms of computational resources needed I like to think in terms of the pyramid of analytical tasks. I’m mostly interested in tools for non-linear machine learning, the distribution of dataset sizes practitioners have to deal with in this area, and how all this is changing in time. The dataset sizes vary over many orders of magnitude with most users in the 10 Megabytes to 10 Terabytes range (a huge range), but furthermore with some users in the many Petabytes range. Fitting a linear regression lm(log10(size_GB) ~ cum_freq + year, ...) for that range, one gets coefficients year: 0.075 and cum_freq: 6.0. We can use this “model” as a smoother in the discussion below. The above results imply an annual rate of increase of datasets of 10^0.075 ~ 1.2 that is 20%. 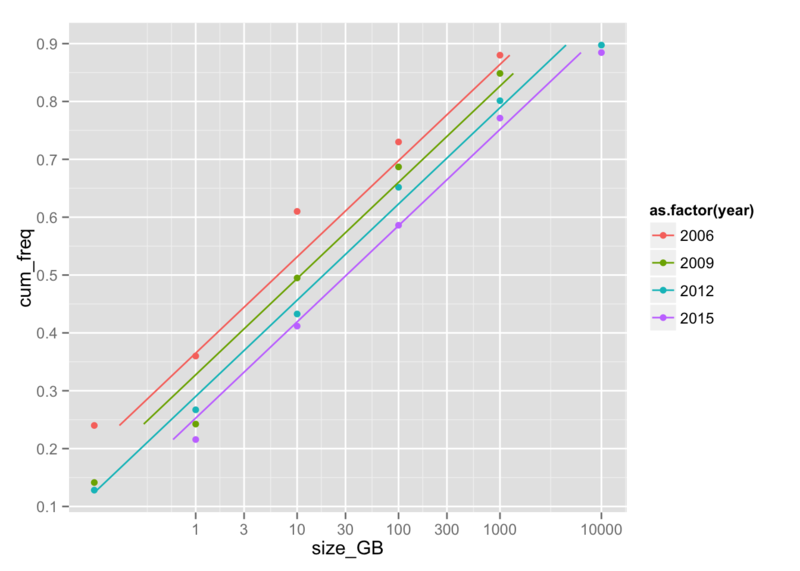 The median dataset size increases from 6 GB (2006) to 30 GB (2015). That’s all tiny, even more for raw datasets, and it implies that over 50% of analytics professionals work with datasets that (even in raw form) can fit in the memory of a single machine, therefore it can be definitely dealt with using simple analytical tools. The Terabyte range is the home turf of data warehouses, MPP/analytical databases and the like, but many organizations are using “big data” tools (Hadoop/Spark) for those sizes. About 5% of uses are in the Petabytes range and likely use Hadoop/Spark. While the hype around big data, “exponential growth” of sensors and Internet-of-Things (IoT) etc. suggests a more rapid growth rate than 20% yearly, the simple linear fit used above does not extend over the 90% percentile and it’s hard to tell any trends for these large sizes from this survey data. A Microsoft research study has found that the median size of input jobs submitted to an analytic production Hadoop cluster at Microsoft in 2011 was 14 GB, and it infers from other studies that the median data size of input jobs in a Yahoo production cluster was 12 GB, while 90% of the inputs in an analytical production cluster at Facebook were of size less than 100 GB. Unfortunately it is unclear from all this discussion above what’s the distribution of dataset sizes used for modeling/machine learning (my primary area of interest). Some informal surveys I have done at various meetups and conference talks suggest that for at least 90% of non-linear supervised learning use cases the data fits well in the RAM of a single machine and can be processed by high-performance tools like xgboost or H2O or in many cases (I estimate 60%) even by using R packages or Python sklearn (see this github repo for a benchmark of the most commonly used open source tools for non-linear supervised learning). Many of the “big data” tools in this domain (non-linear supervised learning) are clunky, slow, memory-inefficient and buggy (affecting predictive accuracy). Either way, the rate of increase of RAM of a single machine has been much higher than the rate of increase of the typical dataset used for analytics (20%). This has huge implications in terms of in-memory (distributed) processing (e.g. SQL) and single-machine processing (e.g. non-linear machine learning or even plain old R/Python). Big RAM is eating big data. For example, the fact that many datasets (already refined for modeling) now fit in the RAM of a single high-end server and one can train machine learning models on them without distributed computing has been noted by many top large scale machine learning experts. Of course, maybe data (useful for analytics) is increasing faster, and the slower 20% per yr increase based on the KDnuggets poll just shows our inability (or the inability of our tools) to deal with ever larger data or maybe there is some strong bias and non-representativeness in the KDnuggets survey etc. Maybe your data increases faster. Maybe you think data is bigger and increasing faster. But facts should trump opinions, so I’d love to see more data and analysis either supporting or contradicting the above results. Bio: Szilard Pafka is an expert data scientist and a leader of the Los Angeles data community. He brings extensive theoretical knowledge (PhD) along with more than 15 years of practical experience in advanced data analysis and developing analytical systems. He is currently the Chief Scientist at Epoch and the founder/organizer/co-organizer of several popular data science meetups in Los Angeles. Follow him on Twitter @DataScienceLA. Do We Need More Training Data or More Complex Models?